> The Stackable Rubber Borders are made from recycled rubber and they BEND! > Environmentally friendly, and offers a sturdy, safe and attractive look to any landscape or playground area. 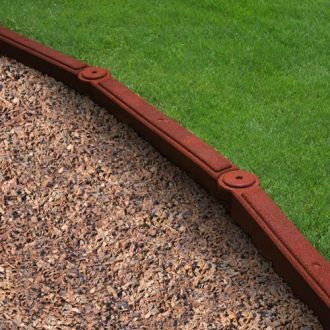 > Designed with a patent pending inter-locking system, the borders create a “seamless look” allowing you to form the shape that best works for your landscape. > The borders are also flexible rubber allowing graceful curves that will keep your mulch in place and even reduce the amount of mulch needed. > They are also stackable to handle varying heights of uneven landscapes, gardens and playgrounds. > Each border's overall dimensions: 48" long x 4" wide x 4.5" tall. > The linear length is 42".